William Henry Davies (1871-1940), who wrote as W H Davies, was a Welsh poet and prose writer who is best known for two works, his early ‘Autobiography of a Super-Tramp’, which detailed his life as a hobo in the United States from 1893 to 1899, and the short poem ‘Leisure’, which appeared in his “Songs of Joy and Others” in 1911. The repeated ‘no time’, which appears in every couplet, rings like a bell in this carefully crafted poem which takes the reader through a catalogue of occasions on which the excuse of ‘no time’ prevents one from enjoying life to the full. The second to fourth couplets refer to the natural world and have most relevance to the rural reader who is likely to encounter boughs, woods and streams in the course of their day. They are salutary reminders that the privilege of living in the countryside is largely wasted if one does not pause and allow its sights and sounds to do their work on one’s feelings and emotions. The fifth and sixth couplets take the principle of ‘standing and staring’ to the highly recommended pastime of people-watching. The title of ‘Leisure’ is an interesting one, because the poem is a call to create leisure by taking the decision to ‘stand and stare’. Davies wrote these words more than a hundred years ago and they are even more relevant today than when he penned them. Most people seem to be ‘full of care’ most of the time and many complain that they have no time for leisure. However, few would disagree with Davies’s conclusion that their life is impoverished because they do not make the effort to switch off and absorb the world around them. We are now in the height of the holiday season and I do hope we all have given ourselves time to take a break even if we are not going away on holiday. We live in a most beautiful county which gives us that opportunity to stand and stare, to take time to see what is really going on around us and to enjoy God’s creation in all its beauty. My husband, when we have taken a short flight and fly below the clouds, says this is what God must see, beautifully tended fields with not a weed or a thistle in sight, animals enjoying their pastures, trees and gardens showing themselves at their best, the sand and the sea sparkling as we pass over, tiny houses full of people leading different lives, and the buildings of our towns and cities portrayed at night by light pollution. Jesus took time to stand and stare, took time out from the busyness of life and the clamouring of the people. Many of his parables and teachings were taken from observing what was going on around him and we often read that Jesus took himself to a quiet place to pray or to set out on the sea to get away from the crowds to find a time of rest and recuperation. We all need to take time to stand and stare, switch off our phones for at least a week, tell ourselves to switch off our I-pads and computers, have conversations with our nearest and dearest, enjoy a meal with friends without any distractions, but above all we need to find time just to be and make contact with our inner self and with God. A month ago I was in Dubrovnik, a beautiful place with delightful people who have had more than their share of troubles in the past. It was a sweltering day so I left my friends to find peace, tranquillity and a cooling breeze by taking a short trip in a small boat with ten other people around the islands. I was so looking forward to the space this short time would give me. I smiled at my fellow passengers and settled back to enjoy the peace and tranquillity. A gentleman to my left started to talk to me; he was an American on holiday and we started to talk about the world situation. For some reason I asked if he was a Christian and the flood gates opened; he had many troubles on his mind and this holiday was to be a time to ‘stand and stare’ and to find God. Other people in the boat listened into our conversation, and before long prayers for all different reasons were being said around the boat. We had all been given that time of leisure, that time to ‘stand and stare’ and pray together in the most beautiful of settings. We all hugged each other as we left the boat to go our different ways. God had been in our midst and we had found him. This summer take time to ‘stand and stare’ and see what happens. Thank God for the many blessings he gives us day by day, find within your leisure time that time to commune with God and pray, and you will find that God is in all that we see and hear around us. My God father was a real man of the countryside who grew up in the Slad valley in Gloucestershire along with Laurie Lee, the author of Cider with Rosie, and they both had a real love of poetry. When he died I inherited some of his books and now and again I look through them and sometime ago I came across the poem ‘Ash Wednesday’ by TS Eliot. In 1928, TS Eliot is contemplating becoming a Christian. He is apprehensive, and records his thoughts in the poem ‘Ash Wednesday’, asking that God’s judgment not rest too heavily upon him. He feels that he is not worthy of God’s love, and that the world is too unsettled, too noisy for a person to hear God. He refers to Our Lord as St John does, ‘the Word’, and writes, ‘Against the Word the unstilled world still whirled about the centre of the silent Word’. The Word speaks in the silence of our hearts, when we are still and quiet. For nine months he prepares in Mary’s womb and, in the whispered prayers of the Eucharist, as the priest embraces the altar and we prepare for his arrival at the words of consecration, he sends before him a stillness. This quietude is the embrace of birth and new life, but also the silence of the grave, the rock that seals our Lord’s tomb while the moonlight cuts shadows across the door of the Holy Sepulchre. We are dust, and to dust we shall return. As Eliot puts it, this is the ‘desert in a garden’, a ‘dream crossed twilight between birth and dying’. Our Lord is risen, but he also carries with him always the marks of crucifixion. We have begun the forty day Lenten journey and seek to identify with Jesus in his wilderness experience, but how do we understand things unless we have contrasts – joy with sorrow, noise with quiet, company with solitude? Each helps to define its mirror image. It can be very easy to make the mistake of regarding Lent as a gloomy miserable time. George Herbert three hundred years before Eliot was writing with irony when he wrote ‘Welcome dear feast of Lent, he loves not temperance or authority’. Herbert’s use of the word feast is interesting and clever; it makes us sit up and take notice because the usual Lenten word is fast. And here lies the ingenious contrast. The Lenten fast is a feast for the soul—–Lent is about blessing, about walking closely with Jesus, about growing in spiritual maturity and depth. Such things are not a privation but a wonderful affirmation of faith. Our yearly season of penitence, starting with the ritual of marking our foreheads with ash’ probably seems daft and pointless to those who have no understanding of the Christian faith. But, in the context of faith in God, the Ash Wednesday ritual and the whole six weeks of Lent, it is an external sign of an inner decision to own up to our own sinful tendencies and a sign of our willingness to look at ourselves critically, and to rededicate ourselves to the values and the way of life of the gospel. Lent, in other words, is about repentance and about the way God changes us and makes us Holy. In Joel Ch 1 drought had already spread death and despair. Locusts had removed the final vestiges of green, and with them any last lingering hope. A solemn assembly has been called in those drought stricken times to fast and offer sacrifice and pray for God’s mercy, but with this latest disaster, what was the point? The sentence of death was upon them. When human beings turn away from God and do evil, the consequence in the economy of God is more evil rebounding upon them. Repent is more often used of God than of humankind, not because God changes his mind but because our relationship with him becomes changed. When we turn towards him, his justice comes to us as love not anger. Lent has the tradition that we should give things up, eat and drink less than we usually do. Fasting has always played a part in all the major religious traditions; at the most basic level fasting lessens our attachment to our ordinary bodily appetite for food and drink and raises our awareness of spiritual hunger, our need for God. The practice of fasting challenges our modern preoccupation with food and eating, and I, probably like many others, will be a bit grumpy as my need and craving for anything sweet bites in. But as we give up things so should we also take up – put more time aside to pray, to stimulate a desire for God rather than for the various substitutes that are available. The rushed, pressured way of life which people live today, filling every moment with activity and resenting solitude and quiet, all are hostile to inner calm, and prayer, and an awareness of God. And lastly if we can, we should be more generous with our money and possessions, both to free ourselves from being dependent on money and possessions and to benefit people who are poor and struggling. Simplicity in relation to material things, freedom from compulsions to acquire and accumulate personal possessions, a genuine concern and care for the needs of others, are all habits to take root in us as we get to know God better. A sort of ‘virtuous circle’ develops when we undertake these spiritual practices, fasting, prayer and almsgiving help clear the way for God, and the more open we are to God’s influence, the more we foster these spiritual attitudes. Repentance is usually a gradual thing; most people don’t change overnight. Getting closer to God normally involves a constant series of conversations, not a single giant leap. Pray that God will give us the strength we need to turn to him sincerely and wholeheartedly, and that we use this lent as an opportunity to come back to him with all our hearts, as the prophet Joel passionately urges. I urge you this Lent to walk the forty days with Jesus, come to the Lent groups and take in the film ‘Les Miserables’ which is challenging at times, but leaves much to think about and pray through. Come to the Lent and Holy Week services, live the liturgy in all its fullness, witness the last hours of Jesus on Good Friday, and come to find a closer more intimate relationship with God. But our Lenten story is just beginning, with the Wednesday Lenten Ash coming in the form of a cross, that instrument of torture where Jesus died for you and for me, taking the sins of the whole world upon himself so that our sins may be forgiven and whose death bestows upon us a life which is imperishable because, being with God life is eternal. As the decorations go up around the town for me one of the focal points are the trees of light organised by the Lions and positioned on the town hall to be seen by all. Each tree is decorated with lights given in memory of loved ones and all the money raised from the trees support various charities. The lights light up the Guildhall square, and mark the beginning of Christmas celebrations in Tavistock. 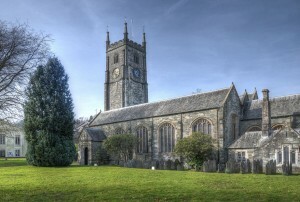 Tavistock Church will be alight with Christmas trees of various sizes decorated by those who live and work in and around the town. Throughout Advent and Christmas and in 2018 we look forward to welcoming you into the Churches of our Mission Community as we celebrate Christ’s light in the world, a light that is with us always even though at times we may be challenged. Our Paschal Candle, which is renewed and lit at Easter, is a reminder to us that Christ’s light is with us in the beginning and at our end, the Alpha and Omega, but also each and every day. May Christ’s light bring you comfort and may his light shine in your hearts. I take this opportunity to wish you all the joy and good news from the angels this Christmas time. By the time this magazine has reached you the Revd. Judith Blowey will have been ordained Deacon in the Cathedral Church of St Peter Exeter to serve in the Benefice of Tavistock, Gulworthy and Brentor, and the Revd. Sue Tucker ordained Priest at St Andrew’s Minster Church, Plymouth to serve in the same benefice. Some of those ordained had been Christians as little as five years, others all of their lives, and had come from various walks of life – and, as ordinands, have over the past four years or, for some, even longer been put through a rigorous selection program and training which has tested their faith, brought them to the verge of collapse when writing endless essays and theological reflections, have wonderfully ignited their vision on the Old and New Testament, have had previous concepts of what they believe turned upside down and have questioned their skills in how they are to serve the people of Devon “with Joy, make disciples and how to pray for God’s Kingdom here on earth”. And much of this work revolved around a man called Jesus Christ, both human and divine, God’s only begotten Son, God himself, sent by God to be the Redeemer and Saviour of the world. Jesus had a dream for our world; He called it the Kingdom of heaven. He dreamt of life on earth being a mirror of heaven itself and towards the realisation of this dream he began to tell people that there is another way to live. Instead of the nightmare of war, he spoke of brothers and sisters in the one family of God. Instead of bitterness and retaliation, he spoke of love that refuses to be poisoned and makes one pray for the oppressor. In place of the spectre of famine which will always haunts a greedy grasping world, he set up the practical criterion of how we feed the hungry and clothe the naked. In the place of the murky world of deeds of darkness, Jesus wanted all of life to be a clear reflection of the light of heaven. He prayed that the will of the Father be done on earth as in heaven. These words in the Lord’s Prayer “Thy Kingdom come, Thy will be done on earth as it is heaven” will always be on our lips and in our hearts. Let us, as we go about our daily lives, be a mirror of God’s Kingdom here on earth and show the light and love of Jesus Christ our Lord and Saviour to all we meet. The existence and work of angels is not something that is often discussed these days, and yet they are of huge significance both within scripture and the tradition of the Church. September could be called the ‘Month of Angels’, as it is the month in which the feast of Michaelmas occurs; perhaps this is a good time to ponder the very real nature and work of the angels. We live in a part of the world where there are several hilltop churches dedicated to St Michael the Archangel (including St Michael de Rupe, Brent Tor), and on Dartmoor we have two other special places of worship dedicated in the name of fellow archangels: St Raphael’s Chapel at Huccaby (which is the only Anglican chapel in the country to be dedicated in the name of Raphael) and St Gabriel’s Church, Postbridge. I recently came across a reference to the neglected feast day of ‘St Michael in the Mountain Tomb’, which used to be celebrated in England on 16th October. The history behind this feast offers an interesting explanation as to why hilltop churches are often dedicated in the name of St Michael. The Feast of St Michael in the Mountain Tomb commemorated the occasion when the Bishop of Sipontum witnessed a series of apparitions of St Michael in a cave on Mount Tumba in Apulia, Italy, in about 490. The Archangel promised that, if the bishop built a place for Christian worship near the cave, he would protect the nearby town of Siponto from attack. The bishop obliged, and built what is now the oldest shrine to St Michael in Western Europe, called Monte Gargano (or Monte Sant Angelo). The feast of Michael in the Mountain Tomb is still celebrated in some places on 8th May, marking an occasion when, through the intercession of St Michael, Siponto was saved from pagan invaders. Interestingly, St Michael is also celebrated on 8th May in the Diocese of Truro, as he is one of the county’s patron saints. Why in England we used to keep the Feast of Michael in the Mountain Tomb on 16th October is an interesting question. It could signify another miracle attributed to the intercession of St Michael in the Mountain Tomb, when a sailor, caught in rough October seas, was saved from being wrecked. This perhaps sheds light on the (later) legend which surrounds the building of St Michael de Rupe, Brent Tor by the grateful sailor who had survived a similar ordeal. All this is very interesting, but still leaves us wondering, what exactly is an angel? They are God’s messengers (the word ‘angel’ is derived from angelos, the Greek word for ‘messenger’). Angels are purely spiritual beings, without their own physical bodies, but possessed of intelligence and their own will—which is why there are both good and evil ones. St Michael fights the evil ones in Revelation 12, for instance, and Jesus himself resists the fallen-angel-in-chief, Satan, when he is in the Wilderness for forty days and nights. Angels haven’t the power to know the secrets of our hearts, or govern our wills, but can assist us in ordering our lives towards God. The idea that they are surpassing in perfection amongst all creatures and that they guard us comes from a number of sources, such as Psalm 91:11: ‘For he shall give his angels charge over thee, to keep thee in all thy ways’. Christ is at the centre of the angelic world, as they were all created through him and for him (see Matthew 25:31). Angels are grouped into three orders: the seraphim, cherubim and thrones (who carry out the work of adoration), the dominions, principalities and powers (who engage in fighting evil) and the virtues, angel-guardians and archangels (who see to the custody of creation). All of these various types and orders of angels are meant to be working together, God working through all of them. We find angels in charge of the elements (Revelation 12:1, 14:18, 16: 1–10), guarding nations (Daniel 10), fighting Satan (Rev. 12:7) guarding us from peril (Daniel 6:22, etc); they protected Lot, saved Hagar and her child, stayed Abraham’s hand, led poor Lazarus to paradise…. and, to top it all, they can sing for ages without pausing for breath! ‘Holy, Holy, Holy is the Lord of Hosts, the whole earth is full of his glory’ (Isaiah 6: 3). The angel Gabriel announced the birth of both Jesus and his precursor, John the Baptist, and visited Jesus (again, singing…) whilst he lay in the manger (see Luke: 2: 13–15). The angels protected Jesus in his infancy, served him in the desert and gave him strength in the garden of Gethsemane (Luke 22:43). The angel in the empty tomb tells the women of his resurrection (Mark 16: 5–7). The fact that Jesus knows and makes use of angels means that we can legitimately benefit from their help, too. The idea that we all have a guardian angel is an ancient one; it is really a crystallisation of what we find written about them in the Old and New Testaments. St Basil said ‘beside each believer stands an angel as protector and shepherd leading him to life’. The idea that we have such perfect and worthy creatures dispensing God’s grace may be difficult to grasp. I think that it is all about company: God loves to have lots of people with him, sharing his life. We all flourish and behave better in good company, so God provides it by giving us guardian angels. The writer to the Hebrews show the flipside to this when he says ‘Be not forgetful to entertain strangers: for thereby some have entertained angels unawares’ (Hebrews 13: 2). This Michaelmas may we be prompted by the aid of the angels to share more fully in the heavenly company which unites earth to heaven, by joining the angels in their unending hymns of praise.